New 2015 Date for our Women’s Boundaries Group! Aspirations Inc. is currently seeking women who are interested in establishing and maintaining healthy boundaries! 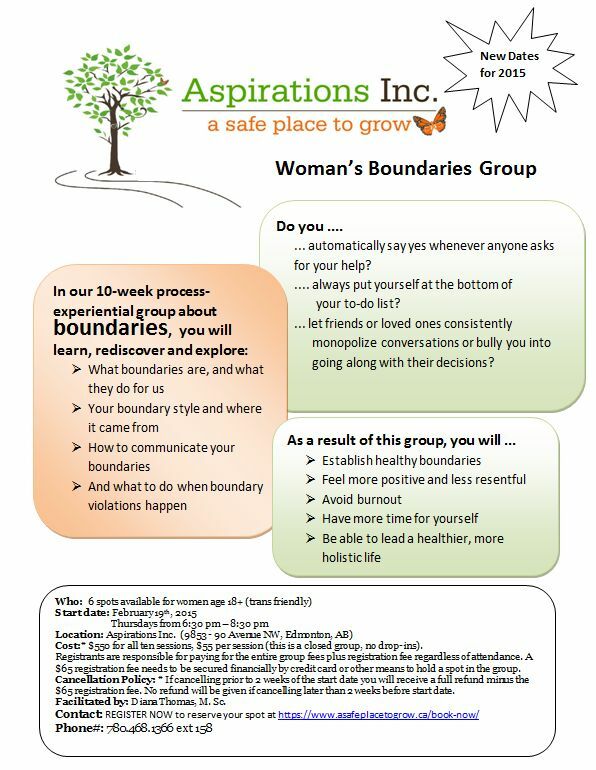 Beginning on Feb. 19 every Thursday from 6:30-8:30pm for 10 weeks, one of Aspirations provisional psychologists: Diana Thomas, will be facilitating our Woman’s Boundaries Group to help you learn what boundaries are exactly and why they are so important in our day to day lives. If you automatically say yes to anything and everything, or always put yourself at the bottom of your to-do list; why not make setting personal boundaries a New Years resolution for yourself and get started on a happier and healthier you? For further information, please take a look at the poster above and reserve your spot today by booking online! PRESENTATION: What the Tween is Going On?